When it comes to pest control issues, the more common conditions we experience are dealing with ants, termites, bees and rodents. For a Northport, NY family, they had a flea infestation in their home. We don’t hear a lot about fleas but they are more common than you think. Fleas hitch a ride on your dog or cat and enter your home and begin seeking refuge in your carpets. Our first call from the homeowner advised us of the family members having numerous bite marks on their arms and legs. They also stated fleas were visible in the home. Some live and some dead fleas were observed in a downstairs room in the house. 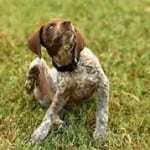 While there are several species of fleas, the treatment for them are mostly similar. Being that fleas like warm blooded objects such as animals and humans, it is important to have your pet(s) checked by a veterinarian. There are numerous topical treatments available. While fleas are often found on animals, the area in where your animal spends time needs to be treated as well. Fleas lay many eggs. In many instances, they will lay eggs on your dog or cat then roll off onto your floor. Spot applications are successful for smaller scale flea problems. In our Northport home, we were facing an infestation where a spot application would have had little or no effect. Our recommended initial treatment for the flea infestation was to use a fogging product throughout the home. The family members were requested to leave the home for approximately 2 hours as a precaution. With such a heavy infestation, this was one of the only ways to mitigate the issue in the least amount of time. We also recommended and provided a 1 month follow-up to ensure the initial treatment was effective. Our standard follow-up program for fleas includes a visit from our trained exterminator once a week for 3 weeks to retreat. After 30 days, if fleas are still present we come back and provide additional treatment. Luckily, the client was happy to report there were no fleas after the 3rd week. This entry was posted in Uncategorized and tagged flea control, flea infestation, flea treatment, fleas, fleas on pets, how to detect fleas, how to keep fleas away on November 12, 2013 by admin.